Today I want to go far from painting and spend some words about traditional sculpting (all with hands, without a computer). All of us painters (I guess…) have had this thought once in their lifetime: I’d like to have “one of a kind” piece to paint, something original that no one can have but me! Following this idea, I’ve approached clay-scuplting world, knowing almost nothing. 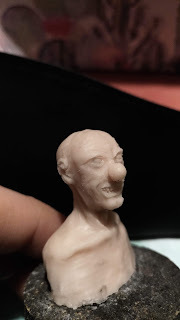 I’ve read some tutorials, asked some friends, tried some tools and toys. This is a complex world and sligthly different from painting (but with some points in common). Here are some tips for beginners, from a beginner and I hope they will be useful to save some time and money on a first approach. 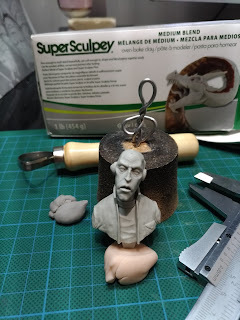 Two parts clay (Duro / Green Stuff, Milliput, Magic Sculpt). You have two blocks of stuff, you have to mix them and the resulting clay can be worked for a few hours, after that it begins to harden. PROS: It’s the easiest way, because you can obtain quickly a solid “resin like” result without worring about casting/cooking/molding and so on. You can work over every other hardened clay or different materials, like wood or plastic without any problem. CONS: You don’t have so much time! It will harden in a few hours. You can’t correct it if you find some errors, the day after. You can’t re-use it if you don’t like result. It’s one time only use. 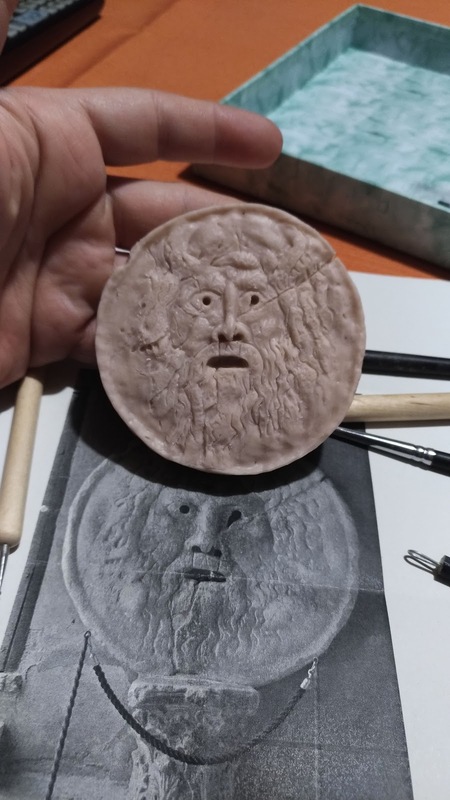 You have a single block of clay, you can work with it forever, and when you have finished, you can bake in an oven and obtain a solid “resin like” product. PROS: You can work on it now and after hours or days. You can make corrections whenever you want, you can trash it and restart, you can make all the attempts you want and restart again. When you are satisfied, put it in the oven for 15 minutes and it will be ready. CONS: Baking could be tricky. If you miscalculate the timing and leave it in oven for too long, it can crack or it could break. You have to bake it at 120°C so you can’t mix it with other materials like plastics. You have a single block of clay that never hardens and can’t be cooked. It’s sulfur-free and you’ll have to use molds made of silicone rubbers RTV (Room Temperature Vulcanizing). PROS: You can work it forever, like the previous clay. CONS: It’s specific for this kind of molding work. For beginners, like me, it’s useless, because at some point I’ll need a solid piece to paint without spending anymore time studying molding techniques. My tip is: use one part clay (Super Sculpey or Beesputty)! We are beginners, we need time to make experiments with tools, surfaces and textures. We have to approach to proportions, body measurements and scales. We have to work and re-work on our sculptures because we’ll make an OCEAN of errors. 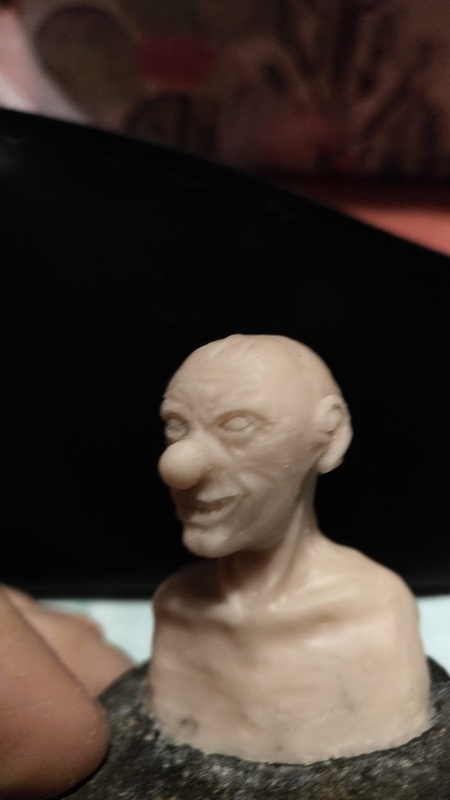 After sculpting your project, take some photos and show them to your friends and other painters. They could spot errors that you can’t see. Go back to your work and fix it, resculpt parts, take new photos and so on. Practice it’s the only way. Always! 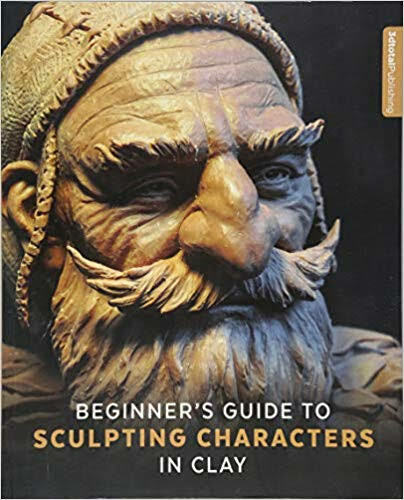 I’ve chosen Super Sculpey because it’s simple to get (Amazon always wins). It comes in two colors: pink and grey. Pink is softer, smoother and simpler to work , grey is harder and more difficult to smooth but it’s great to obtain sharp details. I use both, even mixed. If you can, try both uses: alone and 50/50 mixed. If you want a starting point, use the grey one. It’s a little bit more difficult but it’s for all kind of uses. Sure! Obvious! Use a lot of references! It’s so difficult approaching sculpture with tools and clays and other, so let’s simplify imagining the figure! 1) Real reference: I’ve used that bust from Trovarion, to follow facial lines and dimensions. It’s really important to compare your work with a well-done, real work in 3D. As you can see in photo, I’ve used that bust also to take measures for inner aluminium wire frame. 2) Graphic reference to follow: a drawing, a sketch, an image grabbed from the Internet or from a book. An important thing: you ALWAYS need the permission of the author of the image. 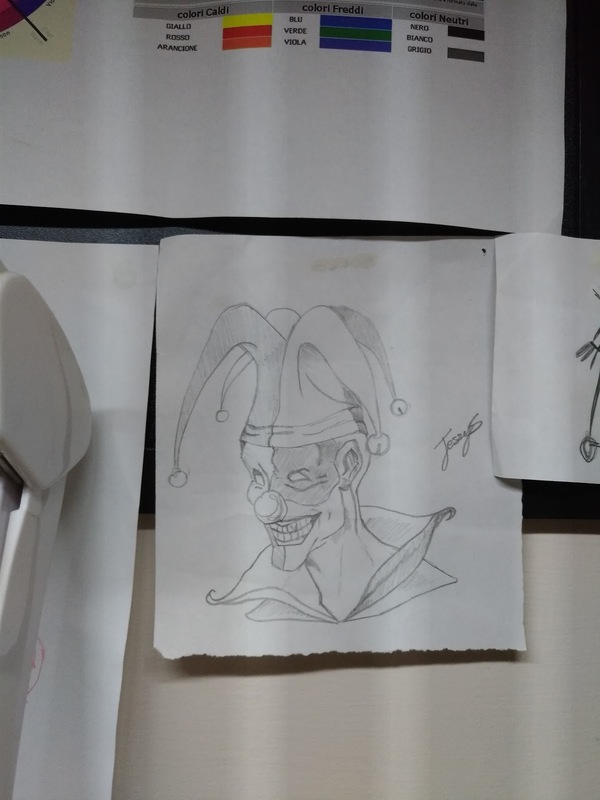 In the photo above I’ve used a sketch made by my niece, a great drawer. 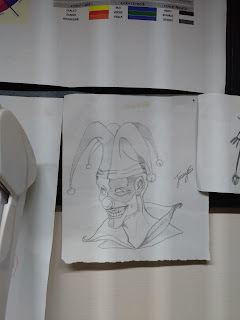 I’m trying to replicate that Jester. 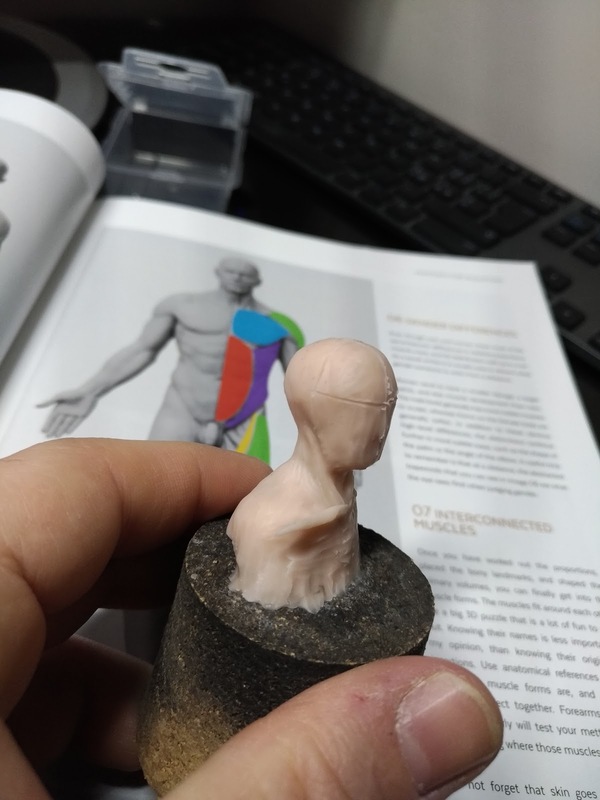 It could be a great first (maybe second) step to have some handful information and references to study from talented and experienced sculptors (not me!). I’ve found this book and it’s my suggestion. Grab it! 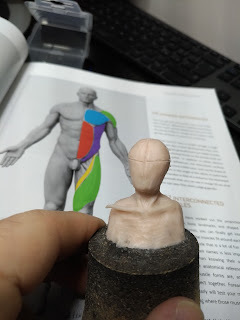 It’s composed from several articles that explain the various tools, clays, anatomy and other suggestions, with a lot of photos. Very useful ! 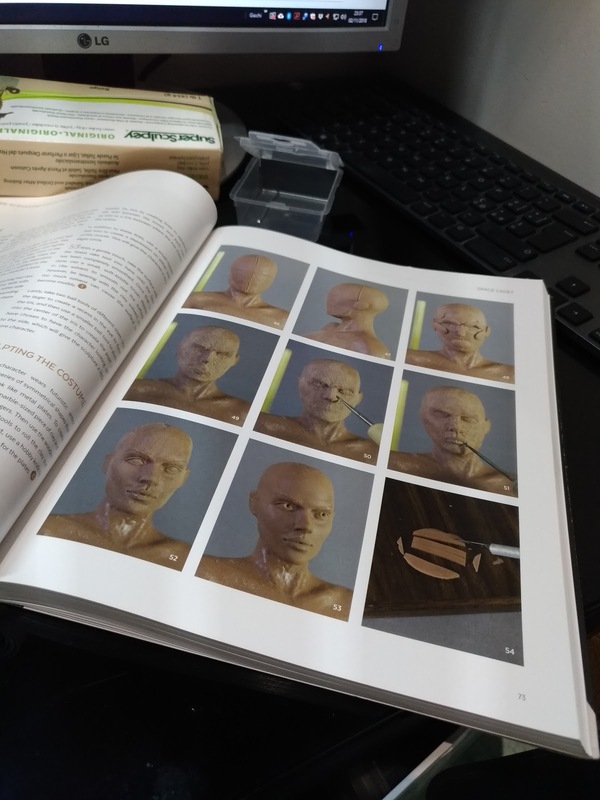 In the second photo above, you can see the page that I’m following to sculpt the face. TOOLS ! CHEAP or COSTLY ? A great sculptor, a friend of mine, gave me this advice “To start sculpting you only need clay and a needle”. Probably it’s a little bit extreme, but it does make sense. 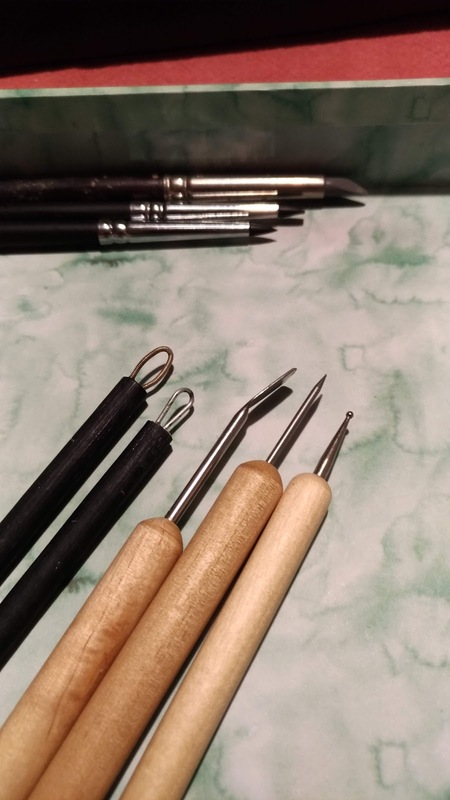 1) A pack of cheapest tools found on Amazon. You don’t know how they work. You don’t know how you feel with them. You only know that you have to gain experience! So, I suggest to buy packs of cheap tools. 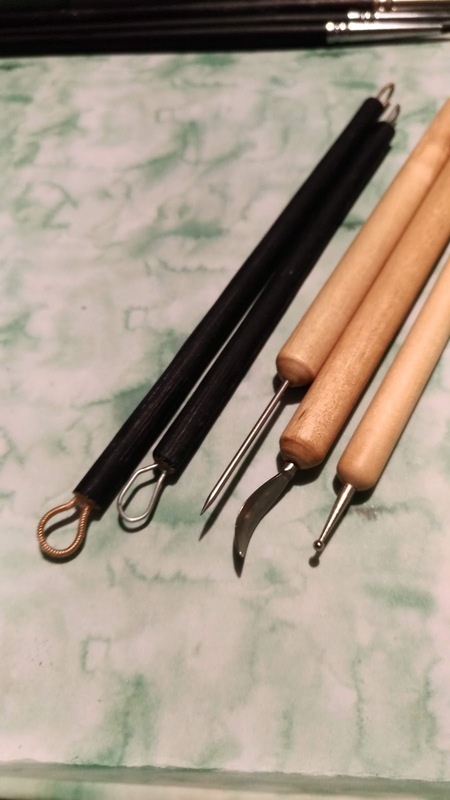 The real problem with those tools is that they are soft, and you can’t use them on hard clays because they could bend or break. Be cool! Our “clays” are really soft, so they will work perfectly! Probably you have to glue some iron edge back in wood, but it’s not a big problem! 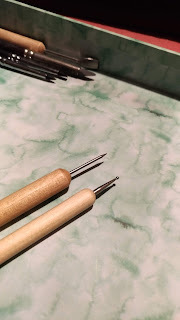 In my little experience, I use a lot of various needles and the ones with the tiny balls on top. You can really use everything… a screwdriver, a cutting knife, toothpicks, pieces of plastic and so on. If you find something that works, use it! After seeing some tutorials, I’ve tried to build my own tools: it’s the ones with the black handle in the photo. 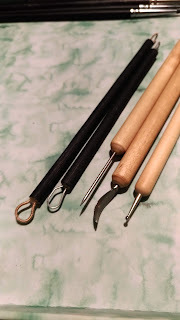 They are “loop tools” that I’ve not found in the packs I bought. One is made from a paper clip (a part of it) bent in a U shape. The other one is made from a bass string. Both glued in little holes made on a wooden stick. Quick and simple! 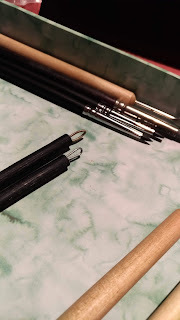 I use the “clip” one to carve and flat clay. The “bass” one to flat and give a little texture. … and NOW ? PRACTICE !! As I wrote before, we have a clay that will stay soft forever (‘til baked) so you can start to practice with it… and you need a LOT of practice! Start with a core wire frame (you can see it in the first photo above) and trow a bunch of clay over it. Wire frame will sustain your sculpt. 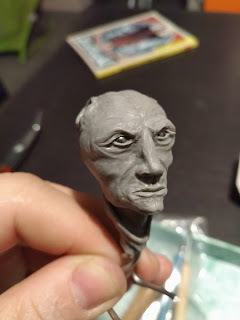 A first exercise could be trying to copy an existent bust, following its facial details and proportions. A second exercise could be following a sketch, focusing on measurements and detail placement. 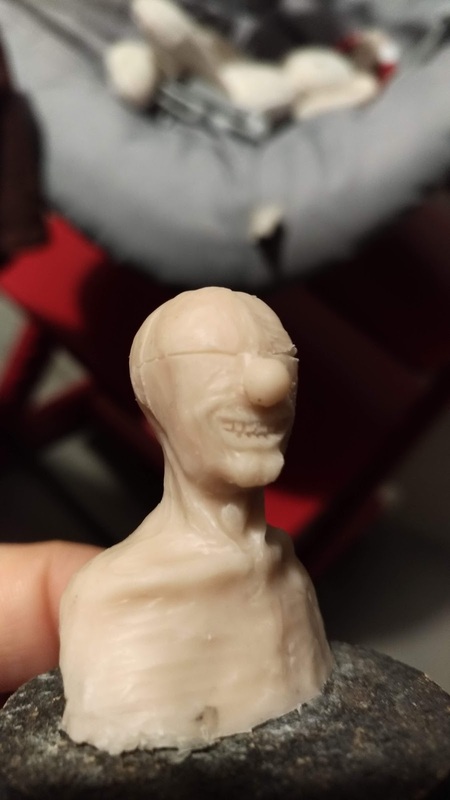 In these photos you can see a raw shape for the head with a line where the eyes are supposed to be. 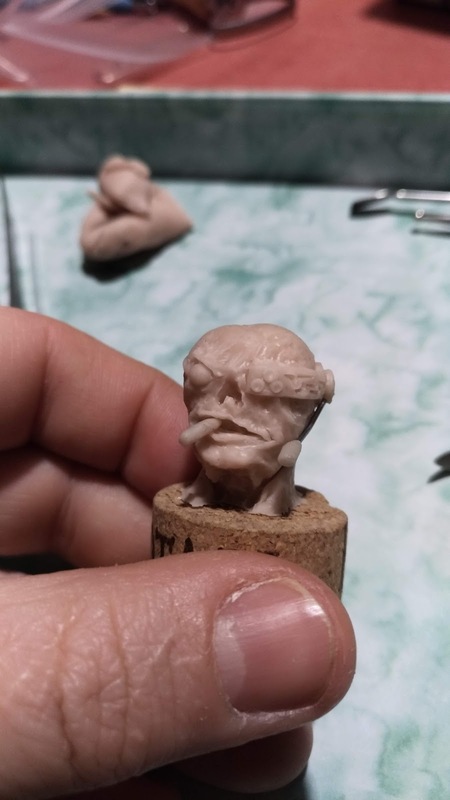 First approach with details: mouth and eyes. The simmetry of the eyes is one of the most difficult parts to achieve. I have to study and practice a lot !! Here is two examples of “practice & practice”. A “flat” (or semi-flat) replica of a roman marble sculpture, on the left and an alien head made without references, only for fun, on the right. With this photo I want to suggest a little trick to sculpt eyes. Using steel balls for the eyeballs it’s the easiest way to have a good starting point for the eyes. 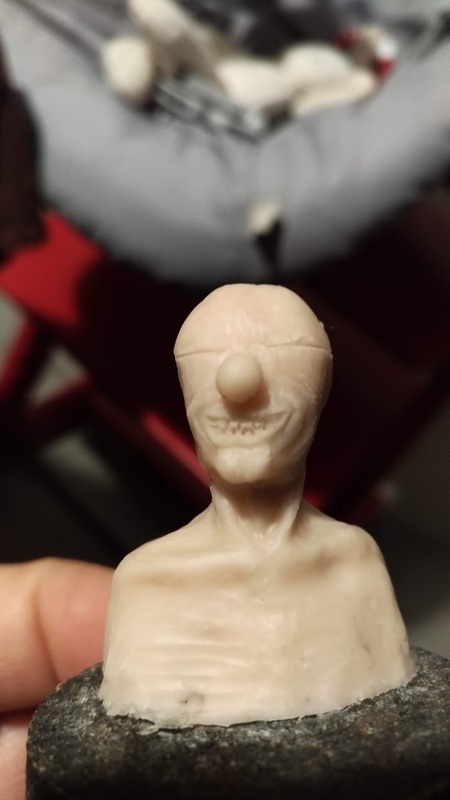 They (obviously) will be identical and you have to sculpt “only” eyelids… and I assure you it’s a lot of saved and simplified work! Remember that you have to bake all, so use glass or steel balls, not the plastic ones. LAST TIP ? Obviously HAVE FUN ! You know, there is only a way to improve: practice! No shortcuts. Practice! If you don’t enjoy what you are doing, you will not improve and you’ll end in wasting time. You are starting this long road and you can walk along it only if you have fun, so HAVE FUN and good luck !